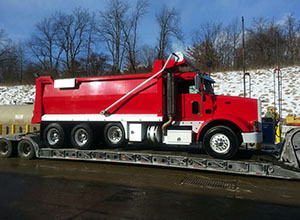 For nearly 25 years, Johansen’s Transport has been a leading provider of heavy equipment transportation in the New England area. Located in Westport, Massachusetts, our nationwide transportation service provides specialized transport services for a wide variety of industries that have heavy haul requirements. The majority of our business is in providing over-sized, heavy equipment transportation for a variety of major industries across the country. Family owned and operated, Johansen’s Transport is focused on the continued growth of our nationwide transportation service. While we work primarily with oversized loads, we have also provided our expert services and solutions for many different types of freight. If you are interested in joining our team, please fill out the following online application below or contact us direct by calling 508-678-8850. For each class of equipment, enter type of equipment (van, reefer, tank, etc. ), start and end dates, and approximate number of total miles.